I quickly devour one and yeah, there's not a whole lot to say. 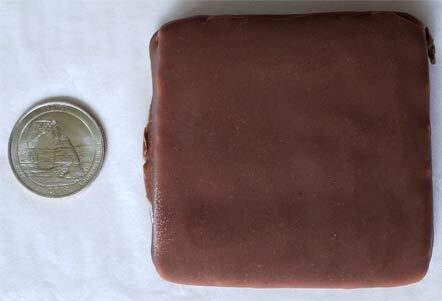 It's a small Klondike bar. I'm not sure I personally have a need for these because it seems like it's a thinner shell to go with a thinner filling and I don't see a ton of fun in that. It seems like you are giving up the flavor choice of the regular version for a bit of portion control. Granted, only eating half a Klondike bar isn't the easiest thing to do, but it is possible thanks to their symmetry and the fact their wrapping is reusable. Great, I just used symmetry in a review. My only other comment is a bit of odd aftertaste. I did quick check the ingredient list to verify there was no sugar replacement going on (because it kind of tastes that way). Since it's not that, I suspect it's just the recipe for the chocolate coating. It is basically the same as a regular klondike but tastes a little different (or maybe the shell is even less amusing than I remember). Geez, I am being really hard on these today. I don't mean to be. I want to like Klondike but they just don't amuse me anymore. Oh well. Don't forget that there is also a Reese's version. 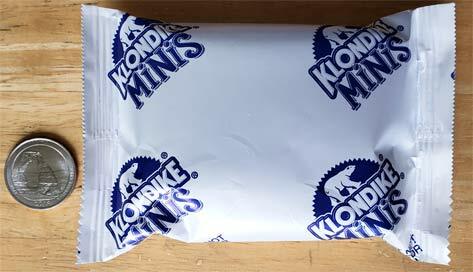 On Second Scoop: It's a mini Klondike. It's tastes familiar yet less satisfying. I re-read the old 100 cal review while prepping this post and realized that it's basically the same thing, just with a few more calories. I don't know how or why it has more, but it does. I guess I should just be happy they added Reese's to the lineup, but it does seem like Klondike just doesn't care anymore. The regular ones are already smaller then they use to be. Soon they will be non-existent.